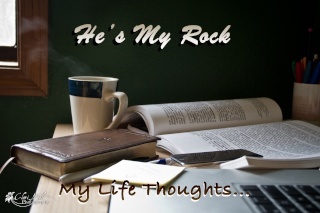 He's My Rock: What does it mean to you? Quiet time with God. What does it mean to you? If your response is, "Oh, it's awesome. I read my Bible and pray half an hour every day! "...that doesn't answer my question. What does it mean.to.you? Sure, maybe you take time aside each day to read the bible and pray. And that's good, really good! But what are you doing during that half hour? If I were to ask you what you read about, what God showed you, would you be able to give me an answer? It is so easy to let 'quiet time' become 'distraction time'. What would happen if during 'quiet time with God' you sought to forget distractions, forget about posting that verse on facebook(side note: that's what the pharisees did, not with fb, but with praying in public places, etc)? Okay, here's a really crazy question: What if you made quiet time about God? I'll repeat it...in case you didn't catch it the first time: What.if.you.made.quiet.time.about.GOD? What if you treated EACH WORD rfom the Bible as God speaking to you? What if instead of praying for what you want, you prayed for God's will and praised Him for all He has done and for Him to teach you His ways? Crazy thought isn't it? It shouldn't be, but so often we forget why we read the Bible, why we pray. It's not an 'okay, my half hour is up, I'm done!' thing - it's learning about God, and His Son, Jesus Christ. Learning about what He did for us, learning about how to follow His will. Not only should we make quiet time soley about God - but we should take what we learn and apply to our lives each day. We should be meditating on God's word, living it through our lives. So I ask you again: Quiet time with God: What does it mean to you?